There certainly is no wrong time of year to visit the island of Roatan! We celebrate so many fun annual events and we love to share those times with visitors. Whatever your vacation plans entail, here are all the best annual events in Roatan that you might want to plan your visit around – whether to enjoy the festivities or avoid them for smaller crowds! One of my favorite annual events, the Music Festival for the Angels happens every March. This outdoor jamfest benefits two wonderful organizations here in Roatan: the SOL International Foundation and Clinica Esperanza. Clinica Esperanza provides vital medical care to our island’s residents. You can donate to Clinica Esperanza throughout the year via their website. There is also a list of in-kind donations they regularly need, so make a little space in your suitcase and bring some supplies to Roatan! If you’re from Canada, be sure to contact Not Just Tourists before you leave to see if they have any medical equipment heading to Roatan. You can help deliver it by just checking in an extra suitcase for your flight. It’s that easy! Another major annual event in Roatan is Semana Santa, or Easter Week. While the dates vary each year, Semana Santa is a week of fun in the sun! Tourists from all over Central America flock to our beautiful islands as schools and businesses tend to close for much of Holy Week. Lots of North Americans have time off during that time as well, so it’s a busy – but electric – time for Roatan! Large cruise ship crowds add to the large Semana Santa crowds, so it’s a common time for expats and other Roatan residents to avoid West Bay Beach and West End altogether. But if you’re ready for a party atmosphere and some great people-watching, this could become your favorite week of the year! Come June, Roatan enjoys the annual SOL International Foundation Dive Shop Olympics. West End and West Bay both become a playground for all sorts of fun competitions, all to raise money for the fabulous SOL Foundation. You’ll see street hockey tournaments and three-legged bar crawls, beach volleyball matches and basura boat races (basura means trash in Spanish…you can imagine the creativity that goes into this one!). The SOL Foundation is a fantastic part of our community in Roatan, so please support them whenever you visit our beautiful islands. You can donate throughout the year to the wonderful work of the SOL International Foundation through their website. Another popular Spring/Summer event is the Caribbean Cup Freediving Competition. It is typically held at the end of May each year, but Roatan will host this international competition in August 2017, in conjunction with the 2017 AIDA Freediving World Championship in Roatan. Hosting the World Championship is a huge honor for Roatan and just shows how important the sport is for our island. The annual Caribbean Cup has become so popular that the two events will coincide in August for an international event of incredible scope. The ever-popular Roatan International Fishing Tournament is held in September each year, during the week of Honduran Independence Day (September 15th). The Fishing Tournament is a fun atmosphere for all, with an almost Carnival atmosphere in West End and many visitors coming from all around the world to compete and enjoy the island life. Whether you fish or not, you’ll love the celebratory feel of this week in September. During this otherwise quieter time for the island, the Fishing Tournament offers us a fun distraction! Also in September, the annual Sundae by the Sea event raises money to benefit Clinica Esperanza. Unfortunately, this year’s event is currently postponed with no definite rescheduled date yet. Hopefully this is just a short-term delay for such a fantastic fundraising event! A new event on the annual calendar is the Roatan Humane Society’s Annual Fur Ball held in January. This is one of very few times that Roatan residents will don their finest for an evening of glamor and fundraising for the island’s stray animal population. After three successful years in a row, I hope this one continues for many more to come! Winter is also the busy season for Roatan as snowbirds join us for several months to escape the snow. More cruise ships arrive in the winter than other times throughout the year, so just keep this in mind for your planning. If you want some wintertime sunshine, then you’re sure to find it in Roatan! But if you’d prefer to avoid all the crowds, consider staying farther from the tourist hotspots or consider coming at a different time of year. Winter is also our rainy season! Don’t forget that all that lush tropical jungle we love has to be properly watered. Rainy season isn’t like monsoon season, but there are still plenty of days with rainfall between October and March. Storms are also more likely, although we are luckily outside of the main hurricane belt of the Eastern Caribbean. And, don’t forget, this is also the holiday season in Roatan! We love to celebrate by supporting each other in the community and giving back where we can. We would love for you to join us in these endeavors. My favorite annual events are the ones that bring people together for happy memories and good causes. The Music Festival for the Angels is an all-time favorite that I highly recommend everyone enjoy. One of the charities that benefits from the music festival is the SOL International Foundation, whose summer Olympics event is always a favorite for anyone in West End or West Bay especially. There’s bound to be something fun and entertaining going on throughout that competition, so just ask around while you’re here! The fishing tournament and the freediving tournament bring people from all over the world to our little island, so even if you don’t care about the actual activities, it’s a fun environment to have such a variety of people gathering together to enjoy a common interest. Whatever events are your favorites, be sure to schedule your visit to check them all out! 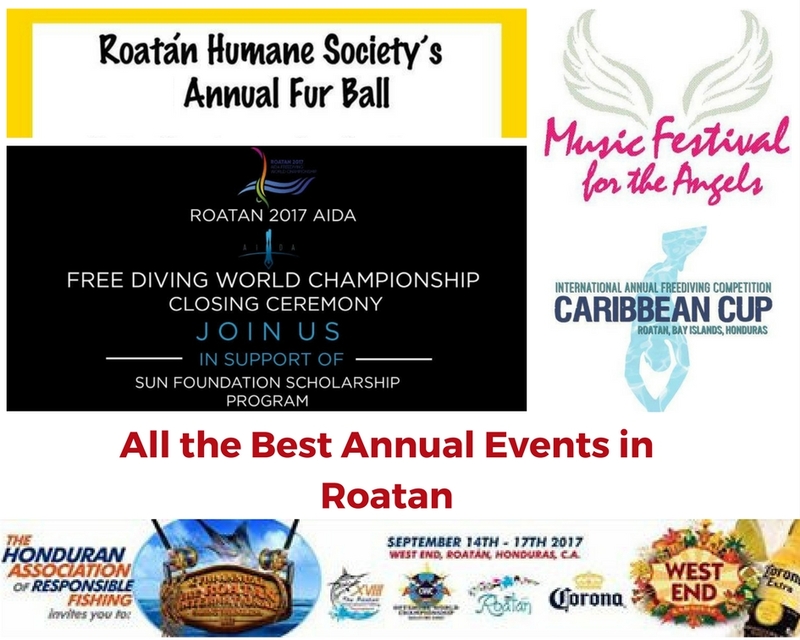 And remember that many of these events are fundraisers to support our community and to ensure that everyone benefits from the increasing popularity of Roatan. If you have questions about your visit or about moving to Roatan, contact me anytime! I love this island life and I love to share it with others. Roatan Real Estate in 15 Pictures! If you’re looking for a buyers market on a Caribbean island, Roatan should be your first port of call. After the housing market crashed in the US, Roatan saw a ..
Are you considering investing in Caribbean island real estate? The Caribbean island of Roatan offers the best of everything: Affordable real estate, direct flights to the U.S. and Canada, tropical .. I am in the business of selling real estate on the Caribbean island of Roatan, located just off the coast of Honduras. But I’m not just here to sell a ..
A West Bay Beach home for sale that you simply cannot miss. Playa Bonita is a popular vacation rental located right in the sand of West Bay…Roatan’s most popular beach! ..
Those of us who love the island life didn’t need to read this study…we knew it already. But, guess what? Research shows that living by the water can actually reduce .. Vacation rentals are all the rage right now. Travelers love staying in a local home and saving money by enjoying having a full kitchen and other amenities at their disposal. .. Copyright © 2019 Roatan Real Estate, Jorge Chavez Roatan, Honduras All Rights Reserved.